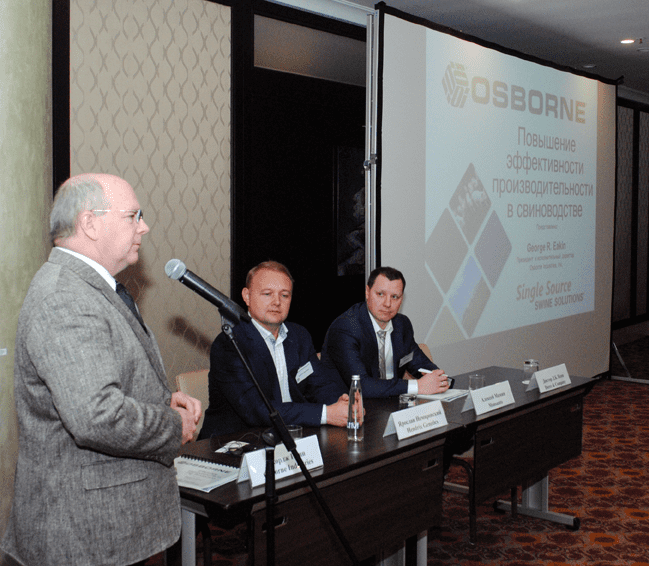 January 29, 2016 – Osborne, Kan. – Osborne Industries, Inc., is pleased to announce it has been invited to present at the U.S. Commercial Service Roundtable in Moscow, Russia, on February 4, 2016. The roundtable, appropriately titled, “Increasing Efficiency in Agriculture,” will highlight best practices and technologies for agricultural businesses to improve productivity and reduce operation costs. The event is put on by the U.S. Commercial Service of the U.S. Embassy in Moscow. Industry experts across many sectors of the agricultural industry will be on hand to present case studies of the leading U.S. technologies and approaches available in Russia. Osborne’s presentation will focus on six areas of livestock production efficiencies, including genetics, nutrition, environment, feeding equipment, marketing equipment and management systems. Osborne Industries’ President and CEO, George Eakin, will represent Osborne at the event. The invitation-only event is reserved for a limited number of guests. For more information on the event, contact Yekaterina Lushpina at the U.S. Commercial Service at the U.S. Embassy, by e-mailing yekaterina.lushpina@trade.gov. Osborne Industries, Inc., is a well-known U.S.-based developer and manufacturer of advanced swine management systems, with an emphasis on RFID feeding and weighing systems. Founded in 1973 in Osborne, Kan., Osborne Industries, Inc., pig production equipment can be found in over 40 countries. For more information about Osborne Industries, Inc., call 1-800-255-0316 (1-785-346-2192) or visit osbornelivestockequipment.com.